Editor's note: It has taken decades for the world's largest water diversion program to come about and Beijing has taken all necessary measures to ensure that each drop of water, transported over great distance, is safe. 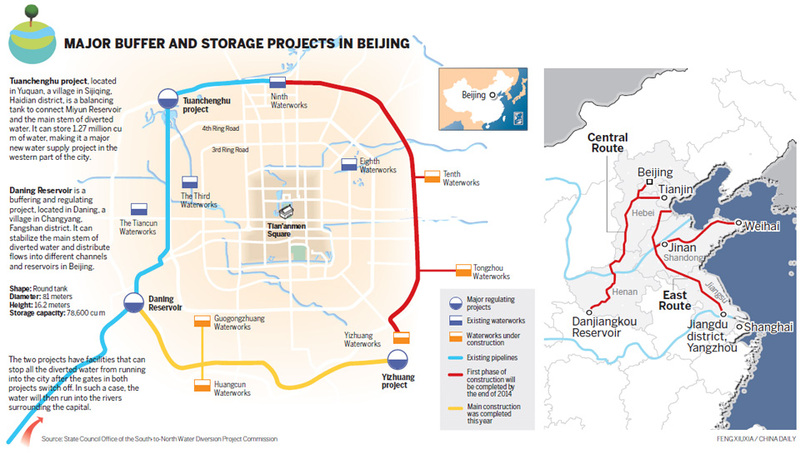 Major water project free from pollution Major buffer and storage project in Beijing. As a key section of the South-to-North Water Diversion Project prepares to go into operation, water quality tests show the battle against pollution is being won. The first phase of the central route of the South-to-North Water Diversion Project is scheduled to be launched in late October. The water quality of 80 percent of the 49 monitored cross sections met mandatory standards last year, proving the water flowing in the central route is clean and safe, said Yu Youjun, deputy director of the State Council's office of the diversion project commission. "Through 10 years of pollution control, the goal of supplying clean water will be achieved when the central route commences next month," Yu said. The water transfer project, which is the world's largest, aims to transfer almost 45 billion cubic meters of water every year from the Yangtze River in the south to help curb water shortages in the north, including Beijing. This will be achieved via three water diversion routes－an eastern route that started to supply water in December, as well as central and western routes. Next month, the central route will transfer 9.5 billion cubic meters of water every year through 1,277 kilometers of canals and pipes from the Danjiangkou Reservoir in Hubei province through Henan province to reach Hebei, Tianjin and Beijing in the north. Unlike the eastern route that saw an upgrading of the Beijing-Hangzhou Grand Canal for a water diversion channel, the central route involves raising the height of the Danjiangkou Reservoir from 162 meters to 176.6 meters and building canals and pipes to divert water from the reservoir to North China. The South-to-North Water Diversion project office has long been concerned about water contamination in areas along the central route from industry, domestic sewage and waste from urban and rural areas. "Some rivers like the Jianhe and Guanshan (from Shiyan, Hubei province) flowing into the reservoir were polluted and even grayish-black in color because of contamination," said Shi Chunxian, an environmental protection official at the diversion project office. "After years of pollution control, the water quality has improved." As the water of the central route is mostly transferred in tunnels and pipes, pollution prevention measures focus on reservoir protection as well as protection of the rivers flowing into it, Shi said.